When you want to create a beautiful bathroom with a truly classic style, you can’t do better than choose a high or low level toilet as part of your suite. These two designs epitomise the traditional looks of Edwardian or Victorian bathrooms. This guide will give you a quick look at the high and low level toilets available at VictoriaPlum.com, and provide some advice on installing one in your bathroom. What is a high or low level toilet? This is the ultimate in traditional style, with the cistern positioned high up on the wall behind the pan, with an old-fashioned pull chain flush. The cistern is connected to the pan via a long stainless steel pipe. This is a similar design to the high level version, but the cistern is much lower down and features a handle flush system. What makes it different to a close coupled toilet is that the connecting pipe is still a visible feature. All our high and low level toilets are designed to complement a traditional style bathroom, and are carefully detailed to reflect a classic look. 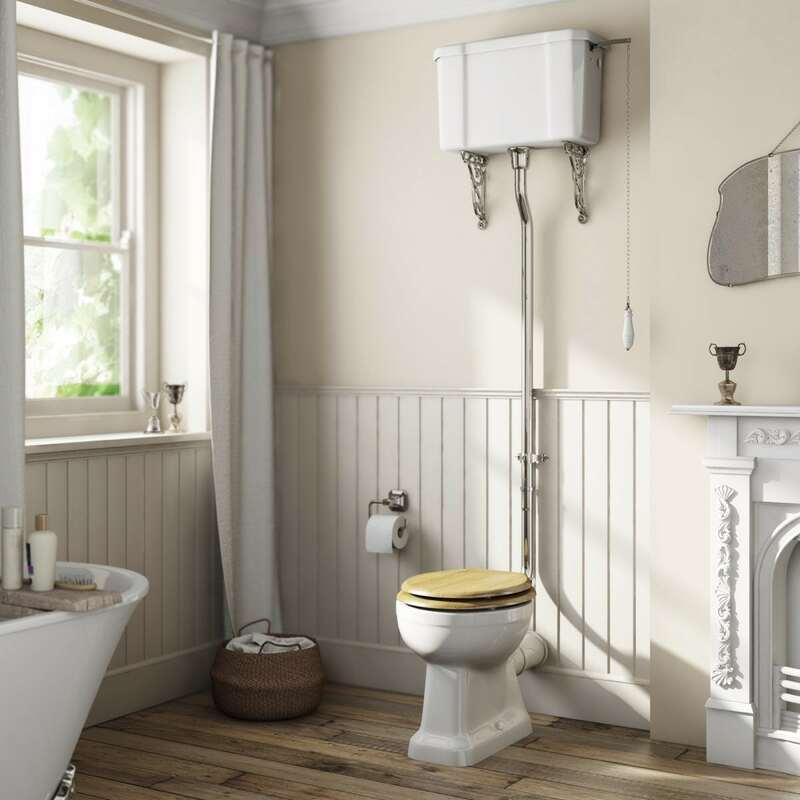 The Camberley high level toilet gives you a high level cistern with metalwork brackets and a stainless steel pipe, as well as the elegant pull chain flush. You also get a solid oak seat to add to the traditional look and luxurious feel. 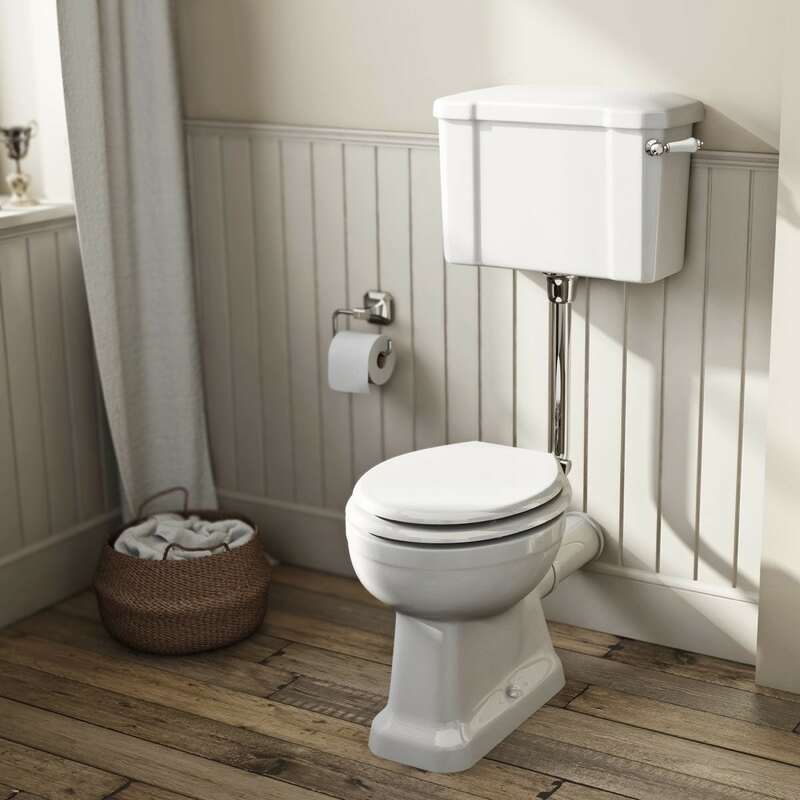 For a slightly more understated look, the Camberley low level toilet provides a beautiful addition to a traditional bathroom. It features an elegantly styled cistern with handle flush, and a stainless steel downpipe. Find your perfect choice in our range of high and low level toilets, and complete your traditional style bathroom with furniture from the Camberley range, or a freestanding roll top bath. You can even find out how to fit a toilet with our handy DIY guides.